Artist Tony Booth worked in Liverpool during the early 1960s, just around the corner from The Cavern Club and close to The Beatles' manager Brian Epstein's office in Whitechapel. Tony's work caught Epstein's eye, and he would go on to produce posters, printed leaflets, and a wide variety of publicity and display material for Epstein's artists, most notably for a young four-piece beat combo called The Beatles. Alongside his work for Epstein, Tony produced hand-painted gig posters for many promoters, including Sam Leach, Alan Williams, and The Cavern Club's DJ Bob Wooler, who also promoted many of the big events. 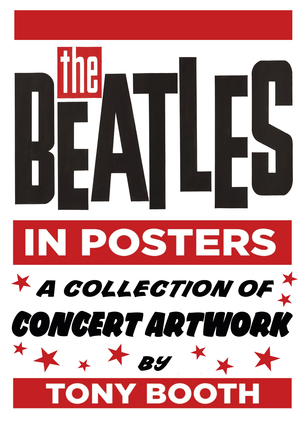 Tony's original posters now fetch a considerable sum of money, and The Beatles in Posters features these as well as his exact replicas of those that have been lost to time. Tony Booth is the original Beatles poster artist and has appeared on television many times to discuss the part he played in the Fab Four's success.